Investigation finds Formosa Steel Plant responsible for the deaths of dozens of tons of fish in April. Taiwan’s Formosa Steel Plant at the Vung Ang Industrial Zone in north-central Ha Tinh province has been found responsible for polluting the sea along the north-central and central coast of Vietnam, which killed dozens of tons of fish in April, the government announced on June 30. Minister and Chairman of the Office of the Government Mai Tien Dung said that, based on strong scientific evidence, the Ministry of Natural Resources and Environment reached a conclusion that the pollution was caused by subcontractors during trial runs at the steel complex. “This has heavily affected people’s livelihoods and businesses in four provinces,” he told the government’s monthly press briefing on June 30. Water discharged from Vung Ang contained toxins that killed fish and other sea creatures. “We have convincing proof that the cause of the mass fish deaths was Formosa’s operations,” said Minister of Natural Resources and Environment Tran Hong Ha. Formosa admitted to the violations. In a letter sent to staff on June 30, Mr. Chen Yuan-Cheng, President of the Formosa Ha Tinh Steel Corporation, blamed sub-contractors at the project. “We respect the findings of the government,” he wrote. On June 30 the company officially apologized to the Vietnamese Government and people and pledged to pay $500 million in compensation. The mass fish deaths were first reported on April 6, when large numbers washed up ashore in Ha Tinh province. The deaths soon spread to nearby Quang Binh, Quang Tri and Thua Thien Hue provinces - a distance of 200 km. Over 70 tons of dead fish were found in the four provinces. Thua Thien Hue also reported that 35 tons of fish raised on farms had died. 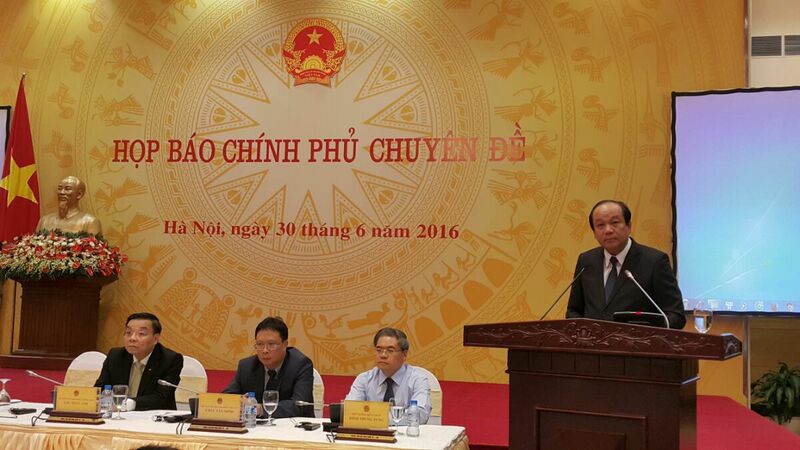 Prime Minister Nguyen Xuan Phuc instructed relevant bodies to immediately investigate and identify the cause. Many theories were put forward in April and May, including “red tide” and chemical toxins in wastewater. The Formosa Ha Tinh Steel Limited Company (FHS) quickly became the prime suspect. FHS, under Taiwan’s Formosa Plastics Group, has been the investor in the Son Duong Iron Steel and Port Complex at the Vung Ang Industrial Zone since 2008, with total investment capital of around $10 billion on an area of more than 3,300 ha. Project capacity is 7 million tons per year in the first phase in 2015, to be raised to 22 million tons in 2020 with capital of $26 billion. The project was licensed in 2008 with three sub-projects: the Formosa Iron and Steel Making Plant, the Son Duong Deep-Water Port, and the Formosa Thermal Power Plant. “This is a lesson for all enterprises: they must comply with legal regulations, including those on the environment,” said Minister Dung. ■ To publicly apologize to the Vietnamese Government and people for causing serious damage to the environment. ■ To compensate VND11.5 trillion ($500 million) for economic losses and for environmental recovery efforts. ■ To completely repair the existing chemical treatment system and ensure all hazardous chemicals are removed from the wastewater treatment system and guarantee that such an occurence will never happen again. ■ To cooperate with Vietnamese authorities and provinces to introduce solutions to control the environmental pollution and to reclaim the trust of the Vietnamese people. ■ To truthfully follow all these commitments. If not, it will be sued under Vietnamese law.